You might be surprised that I got another Stitch Fix package after my disappointment last time. I ended up having an extended email conversation with a stylist who answered my service complaint. My original stylist was no longer with them, but the stylist (Kate) assigned to my ticket suggested that she be my stylist since she could use all the information from our conversation in addition to my style profile to choose my next fix. This time, I was very specific about what I wanted – a lightweight infinity scarf and warm winter tops. I even said to skip pants and give me another top they didn’t have bootcut cords available. Previously I wanted to leave the stylist more room to be creative, but obviously (at least for my personality) it was too early in my Stitch Fix relationship for that. The package was smaller than previous boxes, so I guessed right away that there wouldn’t be pants. Which stinks, because a lot of my pants fit really poorly after the Paleo weight loss (nearly 20lbs and 7% body fat.. more on that some other time). My suspicions were confirmed when I opened the box and Kate mentioned in the note that they didn’t have bootcut cords, so she’d added another top. Just like I asked! Off to a promising start. 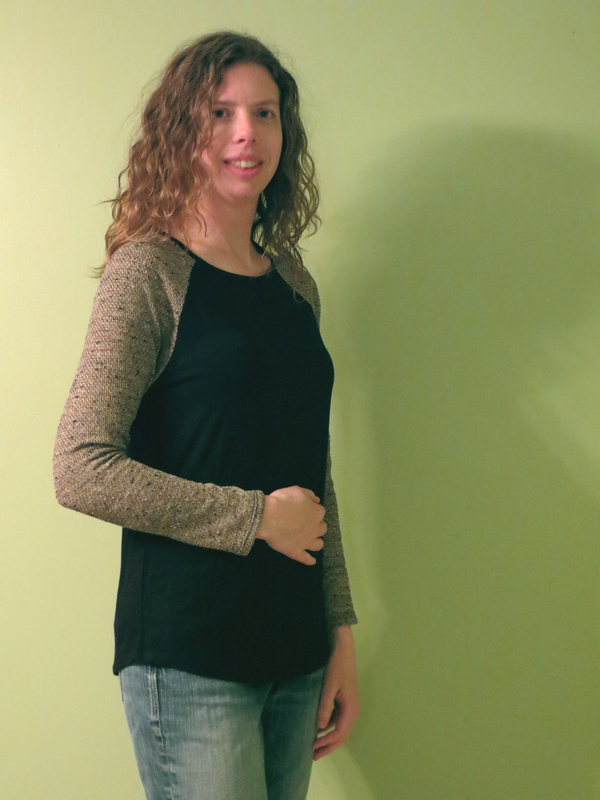 This top was similar to the Loveappella short sleeved top in my last fix. The body is a slinky, super soft jersey sort of fabric and the arms are an open weave knit. The sleeves were a touch short, but within reason. This was a bit ho-hum for me. The “sports jersey” style was great, but open weave arms meant even small breezes touch skin. I’m starting to wonder if stylists understand what Maine winters are like. We may not be Buffalo, NY but it’s still chilly. I had this pinned on my Style board. It looked like a great alternative to the typical sweatshirt. Warm, cozy but still had style. The knit was a little lighter than I expected and teeny bit sheer as a result (the darker swath at the chest is bra show-through). Unfortunately the arms were a little short for my tastes which I just realized you can’t see in the photo. My husband insists that I’m picky but I don’t think sleeves should pull back and expose your wrists whenever you bend your arms. I tried it on again after the photos and could swear the pouch is sewn on off-center. Small thing, but I’m someone who notices the small things… if you haven’t noticed. Ok, this is magenta more than purple like Kate said, so I wasn’t sure about it right off the bat. It was a very light fabric, but I know light can sometimes be warm so I wasn’t going to discount it. Then I tried it on and the sleeves were only 3/4. Strike two. Now, see that little peak of black at the neckline? That’s my bra. The cut actually went lower than my bra clasp, which is a feat on a long torso like mine. Imagine how low that cut would be on a shorty. I really like statement necklaces. I’ve liked them for a very long time, but I always found a reason not to buy them – price, a small detail, etc. Stitch Fix does really well when it comes to statement necklaces, I’ve seen lots that I like and more than a few that I’d buy. This caught my eye right away… shiny baubles, simple design, nice length. This was also on my Pinterest “Style” board, so of course I like it. Light but warm, nice design. If it hadn’t been this scarf, I would have wanted the “Birds on a Wire” design I have pinned. Heck, I still might want it in a future fix. All-in-all, this fix was a win simply because it wasn’t such a big loser. Two things I’m definitely keeping, two things I’m considering, and one thing I’ll keep for the “Buy 5” discount if I keep the other 4. Kate is on the right track and I’d like to see if things can get even better. OVERALL VERDICT: Well, I got the package tonight and I have until Friday to check out and get it in the mail. I am definitely keeping the scarf and necklace. I need to decide on the two knit items before I make things final. I’m tempted to keep them because I joined the service to get clothes and so far I’ve only kept a tank top. But if the tops don’t work for me, then there is no point in keeping them just because it feels like I should. Which way would you go? Keep one, neither, go for the 5? *This post includes a referral link. If you sign up for Stitch Fix using my link, I get a $25 credit to use on future orders. I agree with mom! I Love the hoodie! The point was that I would notice the off center pocket, not others. 🙂 But so many people like it, I’m starting to lean towards keep.